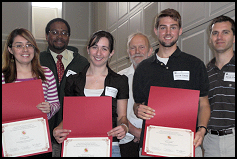 Recipients of the 2008 Distinguished Graduate Teaching Assistant Award are Lina Maria Castano, Sonia Hernandez-Doran, and Scott Owen. They were recommended by Dr. Darryll J. Pines, Dr. Allen Winkellman, and Dr. Derek Paley. Three aerospace engineering graduate students have been awarded the 2008 Distinguished Graduate Teaching Assistant Award at the University of Maryland . A May reception was hosted in their honor at the Orem Alumni Hall within the Samuel Riggs IV Alumni Center on May 14th, and each was presented with a certificate recognizing their contributions as a Distinguished Teaching Assistant. The three recipients of this distinguished award are Lina Maria Castano, Sonia Hernandez-Doran, and Scott Owen. The University of Maryland's Center for Teaching Excellence is an initiative of the Office of the Associate Provost and Dean for Undergraduate Studies. Its purpose is to support the campus-wide efforts to enhance and reform undergraduate education and to offer tangible assistance to individual faculty and TAs as well as to the departments and colleges in which they work.